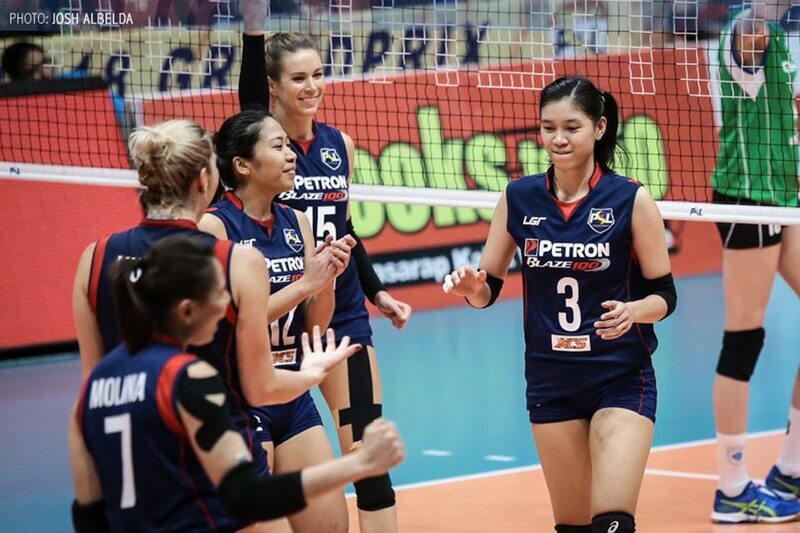 Petron made a short work of Smart-Army, 25-12, 25-15, 25-17, to book a ticket to the finals of the Philippine Superliga (PSL) Invitational Conference at Muntinlupa Sports Center Saturday. Marching to the finals for the fifth consecutive time since the 2016 Grand Prix, the Blaze Spikers will face the winner of F2 Logistics and Cignal in a best-of-three championship series starting Thursday at the FilOil Flying V Centre. Sisi Rondina and Aiza Maizo-Pontillas led the assault with 9 points apiece while Ces Molina and Mika Reyes chipped in 8 and 7 hits, respectively. “It was an unpredictable matchup for us. So we focused on our team, our strengths and good thing we executed it well,” said Petron head coach Shaq Delos Santos, who is eyeing the team's second straight title of the season. It took only 70 minutes for Petron to beat Smart-Army winning the first two sets easily and pulled away with a 20-14 lead from seven straight points before Rondina nailed four of their last five points. Dimdim Pacres was the lone bright spot, as she finished with 7 points for Smart-Army, which was relegated to the battle for bronze medal against the loser in the other semifinal pairing. Dissecting Data: Can new telco challenge Globe, PLDT?